Do you want to start a podcast, but don't know where to start? That's normal! Starting something completely new to you can be overwhelming, but knowing what to expect can make things easier. That's why I've put together a 3-part guide to guide you along the process of starting your podcast. This first part deals with planning your podcast, and setting the foundation for your awesome content. You might already have a topic in mind for your podcast. If so, great! If not, think about your passions, what you're knowledgeable about, and how it can help others in some way. You don't have to think of something entirely new. Even if your topic has been done before, you have a unique perspective that deserves to be heard by your listeners. Now let's think about your ideal audience demographic based on the subject of your podcast. Feel free to be specific. What's their age range? What's their occupation? Do they have children? Where do they spend most of their time? This information is useful for determining the format and frequency of your show that will best serve your listeners. what format fits your show? There might be more than one style that will fit your topic, and that's okay. You can experiment until you find the one that works best. Don't be afraid to ask your audience what they prefer. Along with the format, you should think about music and sound effects. At the very least you will need something for your podcast intro and outro. If you want more, you can incorporate music or sfx underneath certain sections or as a transition between sections. If you're doing a fictional podcast you'll most likely be using more music and sound effects. Consistency is key when it comes to the format of your show and how often to publish your episodes. Your audience likes to know what to expect, and this demonstrates commitment on your end. To help determine the optimal frequency to publish your episodes, it is important to evaluate your personal schedule and consider the nature of your topic. Many podcasts release on a weekly basis, but you can opt to release every two weeks, once a month, or even daily. Be realistic about the amount of time you can dedicate to your podcast. If your podcast is based around current events, you'll want to release more frequently. More time will be needed for research-based topics or fictional storytelling, and you can either release less frequently or prepare a batch of episodes before releasing them individually on a more-frequent basis. how long should each episode be? Generally, your episode length depends on either the topic, the frequency, and/or your target listener. Where is your target listener? If your target listener is a working professional, they might be listening to you on their commute. In this case you might want to aim for an episode length that matches the average commute time so that they can finish an episode in one trip. How dense is the subject matter? Does your podcast require intensive and focused listening? If there's a lot to unpack you can plan on breaking up your episode into to smaller, more digestible chunks. How often are you publishing? Your audience's time is valuable. A good rule of thumb is to create shorter episodes for daily publishing and longer episodes for monthly publishing. Overall, each episode can be as long as it needs to be. If your episode ends up shorter than you were aiming for, that's perfectly fine! I advise against trying to fill time with unnecessary content. Remember, your listeners' time is valuable. what's the best name for your podcast? Alright! Your plan is starting to be more clear. Now that you've thought about your structure, the frequency, and your audience, you're ready to lock down awesome name. Your podcast name should be concise and catchy. You want each potential listener to get a good sense of what your podcast is about just from the title. Ideally it'll be 1-4 words, but the important thing is that it's easy to remember and can be read easily on your podcast logo on small screens. Also, make sure it's unique. I highly recommend doing a search on Apple Podcasts, Google Podcasts, Twitter, and Instagram to make sure there is not another podcast already out there with the same or similar name. Also, it doesn't hurt to do a trademark search of your desired name, to prevent any issues down the road. how will the artwork look? With an awesome idea and cool name, you can now create the perfect cover art. The main thing here is to stand out. 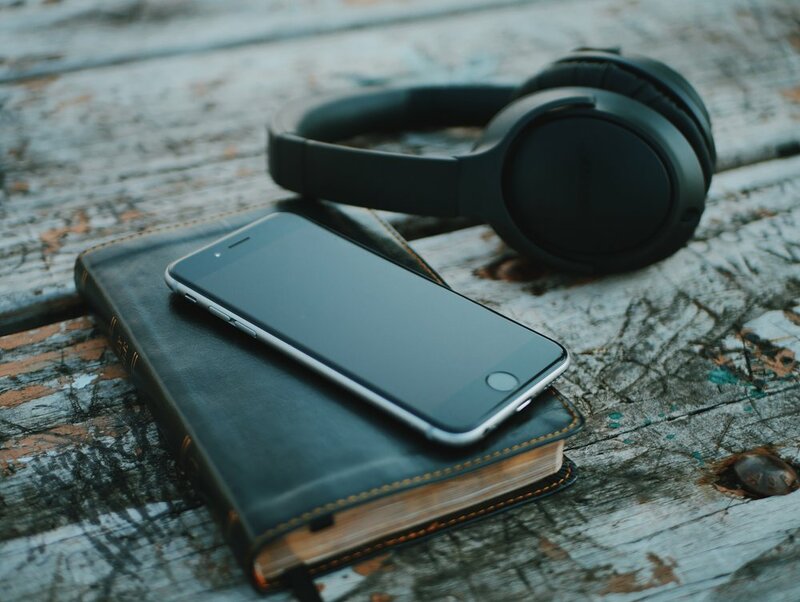 There are thousands of podcasts out there, and when someone is browsing on a podcast platform such as Apple Podcasts, it can be easy to be drowned out. Make sure you have a high-quality logo that is easy to read at a glance on a mobile device. The less clutter the better, and green, purple, orange, pink colors tend to stand out more. You can opt to hire a graphic designer, or put one together yourself by using a user-friendly online tool such as Canva. Alright! Once you've put together your plan, the next step is to put them into motion. Next up is Part 2: Production!